In our house, Simon is responsible for Yorkshire Puddings. His mum passed her recipe to him and he’s made it his own…I don’t want to mess with perfection so I leave the cooking of these delicious Yorkshire Puddings to him! Place 2-3 mm of vegetable oil (or for the best taste, use dripping instead) into each well in a Yorkshire Pudding tray. DO NOT OPEN THE OVEN before the 20 mins are up or your Yorkshire Puddings will collapse!!!! 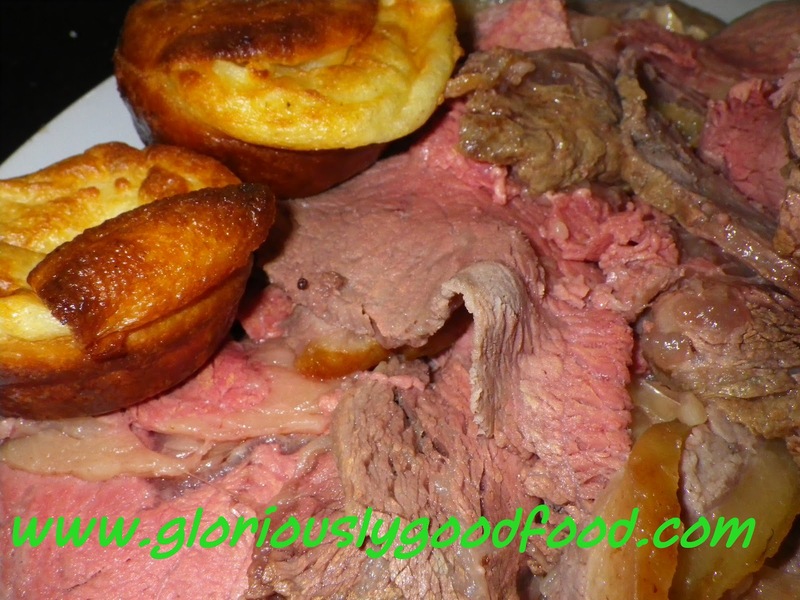 For the Roast Beef Recipe to accompany these Yorkshire Puddings, click HERE. We currently have a lovely house guest (one of my school friends from Luxembourg has sent us her 12-year-old daughter for 2 weeks as she is starting in an English school in September and needs some English practice), so I took the opportunity to cook a quintessential British (and Yorkshire!) meal. I like my roast beef really juicy and I quite like the fatty bits, so I like roasting Boneless Rib Roast. I was also feeding a meat-loving family of 5, so we munched our way through best part of a 1.1kg roast. If you like the roast as rare as we like it, cook it for 15 mins per 500g plus 15 mins extra at 200°C in a fan-assisted oven, so for a 1.1kg roast, cook it for 48 mins in a pre-heated oven. Remember to allow 10-15 mins standing time at room temperature at the end. If you prefer your beef slightly more cooked, increase the cooking times accordingly. Roast according to cooking times shown above. Take out of the oven at the end of cooking, remove the juices for gravy if desired, and leave covered, at ambient temperature, for 10-15 mins to ‘rest’ before slicing very thinly. For the Yorkshire Pudding recipe, which is the one my hubby Simon Roberts has made his own after his mum passed it down to him, click HERE.